The first post in the series is here. The previous post (Topic 2, Part 2) is here. I had the same all-my-eggs-in-one-basket problem with this original Topic 3 assessment as I did in an earlier assessment. 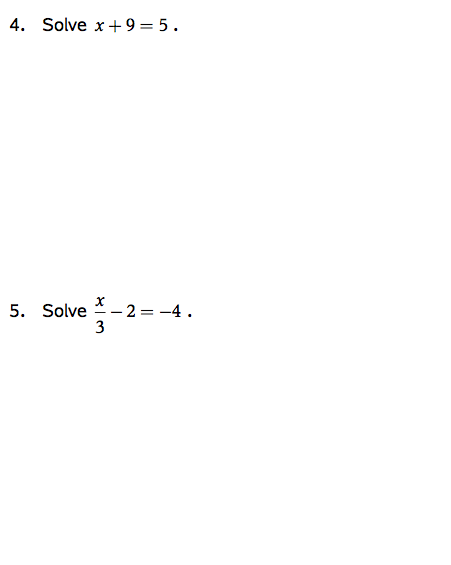 If students aced these two questions, I knew they were capable of what they ought to be able to do. However, if they missed one or both, I was stuck without much information. There was no gradation in the all-or-nothing results. Another issue: the assessment focused entirely on procedural skills and demanded nothing from students in terms of demonstrating deeper conceptual understanding. As was the case with Topic 2 (detailed in posts here and here), I addressed the above concerns by lengthening the assessment quite a bit. The revised Topic 3 assessment weighs in at two pages and a total of ten questions. The net result of the these changes is a much stronger assessment, with improvements in at least two categories. The new assessment (1) provides me with more specific insight about student strengths and weaknesses, and (2) demands more of students in the way of critical thinking and clear communication. I fully expect that this new assessment could be improved in half a dozen ways. Part of the beauty of teaching (and writing many of my own lessons and all of my own assessments) is the opportunity for continual improvement over the years. This job will never leave me bored! Is there anything in particular you liked about the improvements I already made to my Topic 3 assessment? Do you have a few more ideas for making it even better? Share away! 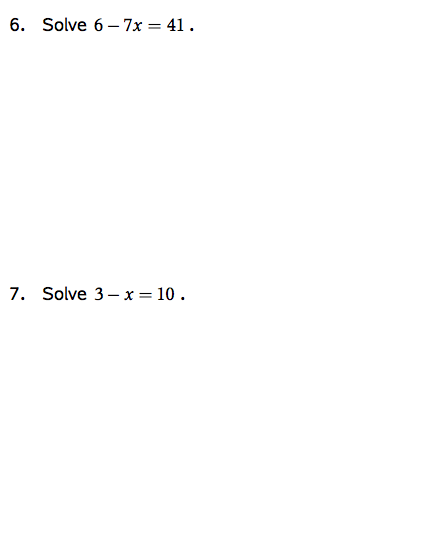 I really like question 3 but I wonder how many students clearly read those instructions. Have these been field-tested yet? I love the open-ended nature of that question in particular. I also always like the ‘find the error’ questions although I am not very good at writing them. 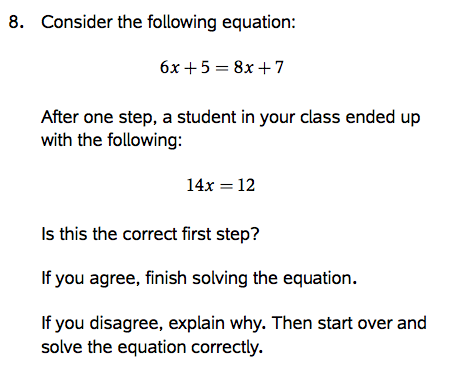 @mrdardy All of the assessments/questions that appear in this series are ones I’ve given to my students. Student performance on that question was mixed. Among those who did poorly, there seemed to be two groups: (1) Those who understood the basic idea of the question but ignored certain specific requirements (e.g., an equation involving addition and multiplication), and (2) Those who clearly didn’t understand what the question was asking. I wish I could think of a way to write it more clearly. The current form will have to do until I (or someone else, maybe you?) can think of a way to tweak the wording to make it more clear (without giving too much away). “The equation 2x+1=7 has a solution of x=3 and involves multiplication and addition. What do you think? Improvement, or a step backwards? Equations of the form ax + b = c involve both multiplication and addition. Solving this would require division and subtraction. 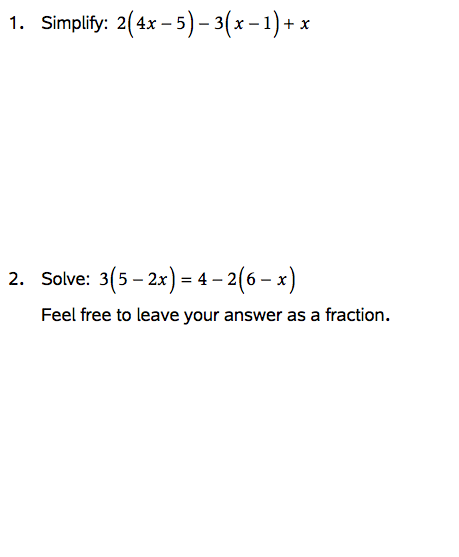 Please write an equation involving multiplication and addition that has a solution of x = 4. Enter your email address to follow Reason and Wonder by email.